add the bread crumbs and crab meat gently. Place patties gently onto a baking sheet, cover and place in refrigerator for 30 min. Cook over medium high heat in a large skillet (do not press down on the crab cakes.) 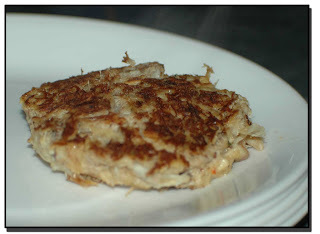 Add crab cakes after the skillet is hot. Cook 3 to 4 minutes on each side or til browned. Do not over cook or they will be dry! the recipe sounds delicious and i can't wait 2 cook it up(albeit substituting the crab meat with minced fish)for my mom. i'm sure she'll be delighted too !